When every blog I read about a destination talks about the endless crowds even in the off-season, I am immediately turned “off”. We like to travel to places in the off-season for the luxury of having places to ourselves once the summer crowds head back to their homes and back to school. 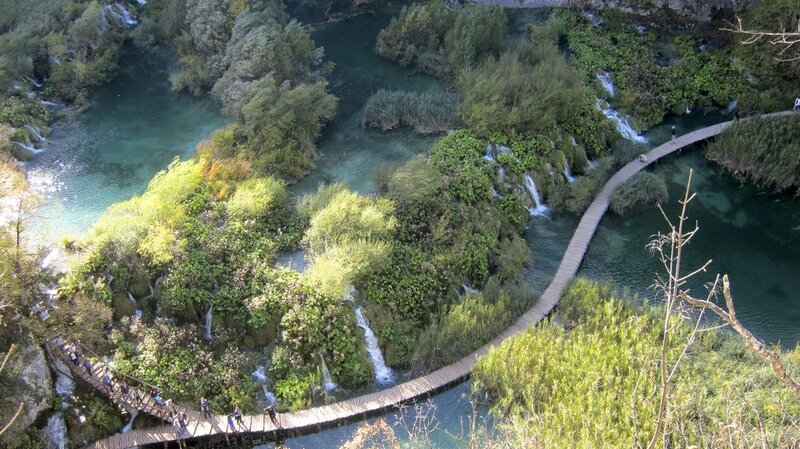 My research on Croatia continued to bring up Plitvice Lakes National Park, the largest national park in Croatia. For two people who love nothing more than national parks, it seemed like a no-brainer. But almost every review I read complained about the massive amount of visitors crowding walkways and ruining photo opportunities. Blah. Sounded terrible. But, every Croatian we met kept telling us we had to go - that it was the crown jewel of Croatia. We had a few days to kill before our plans had us in Slovenia so we sucked it up, rented a car and headed to the mountains. The first waterfall you see entering the park from entrance one. A few upper lakes from the beginning of the program K hike. And, last but not least, this. The famed walkways as viewed from the end of the program K walk. But if we've learned anything in our years visiting national parks, it's that you need to walk further, get higher and start earlier than everyone else to have the place to yourself. With all of these things on our side, we took a five-hour walk, saw hardly anyone and had tremendous views all to ourselves. While everyone else was relying on buses and boats to take them around the park, we relied on our four feet and saw virtually all of the park without the crowds. -Go during the off-season and during the week. We were there on a Monday in mid-October and there really weren’t as many people as I had been dreading. -Arrive early. We were in the parking lot of entrance one before 9 a.m. and were one of the first 15 cars. There were two people ahead of us in the ticket line. Well, besides the huge tour that was just entering the park as we were buying tickets. But we walk fast so we soon passed all 50 of them on the trail. -Choose a longer and more demanding walk than most people (if physically able). We chose program “K” that was marked as a six- to eight-hour walk around the entire length of the park. Since we arrived early enough, even at eight hours we would be done before sunset. After dodging toddlers, camera junkies and slow walkers at the first waterfall, we immediately started climbing up and in no time had the trails all to ourselves. Along the upper portions of the lakes, we came across a handful of people. Looking down below, the visitors on the lower lake walkways were not as fortunate. The hike was long as it hugged the shore of lake after lake, but it was a beautiful walk in the fall and well worth escaping the crowds. The trails are extremely well marked throughout the park so choose a letter program that works for you and go for it. -Wait it out (and bring a bottle of wine). When we got down trail from the upper lakes we joined the main trail through the park where there were significantly more people. We knew that relaxing for a while and letting the crowds go by would lighten up the trail for us later so we popped the cork on our bottle of Plavac from the island of Hvar, sat down on a bench opposite a waterfall and saw a few envious eyes come our way. Plitvice Lakes was incredibly beautiful and we are happy with our decision to make the trip there. The only negatives were a relatively expensive entry fee (almost $20 USD each), which didn't include parking. We finally ran into someone on the trail so we could get a picture of the two of us. Thank you nice Swedish man! A day is enough in the park and there are plenty of accommodations in the surrounding area to stay for a night. We found a welcoming and budget-friendly spot at Villa Lika, just a short drive from Entrance 2. We chose to rent a car, getting a good deal through an online site, which was cheaper and more flexible than the two of us trying to take the public bus back and forth. If we had been in Croatia during the summer months, I'm not sure I would feel the same way. Each year more than 1 million people visit the park so best to plan your trip accordingly.